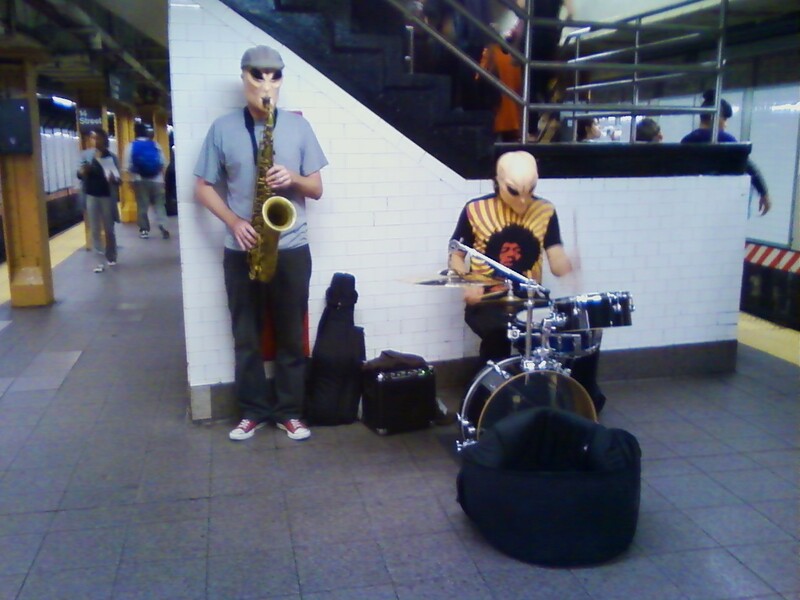 Lately I've been noticing more subway musicians wearing funny masks or even full costumes. On the surface, it seems like a ploy to make up for other shortcomings. But I've actually heard some pretty good music from these acts. The guys pictured above we're churning out a nice jazzy rendition of The Police's "Walking on the Moon" at the L train platform at Union Square. Perhaps it's not enough to just play well anymore. There has to be something unexpected to get New Yorkers to pay attention for a decent length of time. I think this is a great technique to raise awareness of great musicians and mellow music. The alien masks are awesome!! Thanks for the post!! Mind if we use your photo on our website? Hey, Alienband, don't mind at all! It's crappy image quality though b/c I shot it with my camera phone. Thanks for reaching out! I don't think you need a gimic to get recognized in NYC - there are plenty of crappy musicians with gimics, as you said. What got your attention was that the music was good.